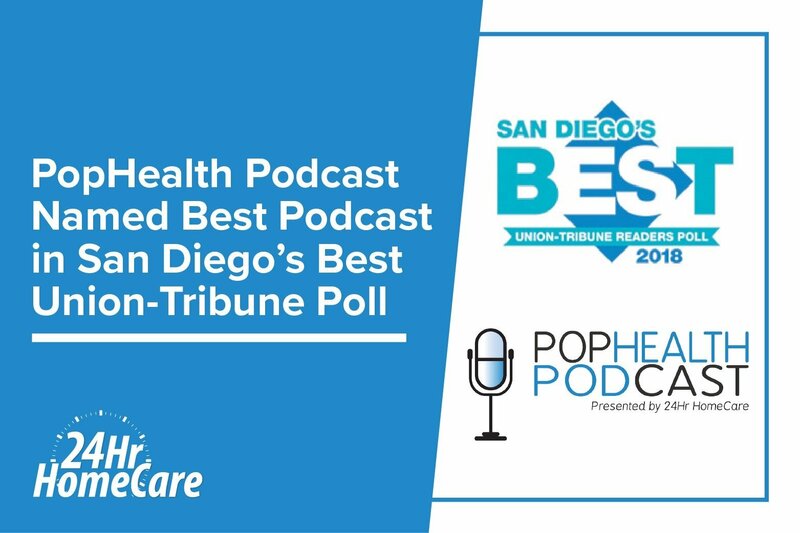 Los Angeles, CA – PopHealth Podcast is honored to be named the Best Podcast in San Diego by the readers of the Union-Tribune. These annual awards are given to the company and service that delivers quality products to the San Diego community. The winners are chosen by the readers, for the readers, as Union-Tribune boasts its readers poll as a great way to navigate through the different services offered in the San Diego area. PopHealth Podcast, available on iTunes, Stitcher and Spotify, is a bi-weekly podcast, hosted by 24 Hour Home Care’s Regional Directors of Strategy and Partnerships, Gavin Ward and Zachary Morgan. Together, Ward and Morgan bring a combined 20 years of health care and home care experience, allowing them to bring thoughtful and meaningful ideas to the discussions and topics. Each podcast explores the healthcare industry, challenges that face the American Healthcare system and strategies that can help improve the healthcare system for Americans. Each episode features a new guest that is prominent in the healthcare industry, such as Tom Jackiewicz, Senior Vice President and CEO of Keck Medicine of the University of Southern California. PopHealth Podcast, presented by 24 Hour Home Care, facilitates thoughtful and meaningful discussion on topics related to, but not limited to population health, care transitions, and readmission prevention, with the goal to provide listeners with a wealth of knowledge on issues which affect millions of Americans every day, and provide a glimpse inside the world’s largest healthcare system.